Gabriella Coleman’s Hacker, Hoaxer, Whistleblower, Spy (HHWS) tackles a difficult and pressing subject: the amorphous hacker organization Anonymous. The book is not a strictly academic work. Rather, it unfolds as a rather lively history of a subculture of geeks, peppered with snippets of cultural theory and autobiographical portions. As someone interested in a more sustained theoretical exposition of Anonymous’s organizing and politics, I was a bit disappointed, though Coleman has opted for a more readable style. In fact, this is the book’s best asset. 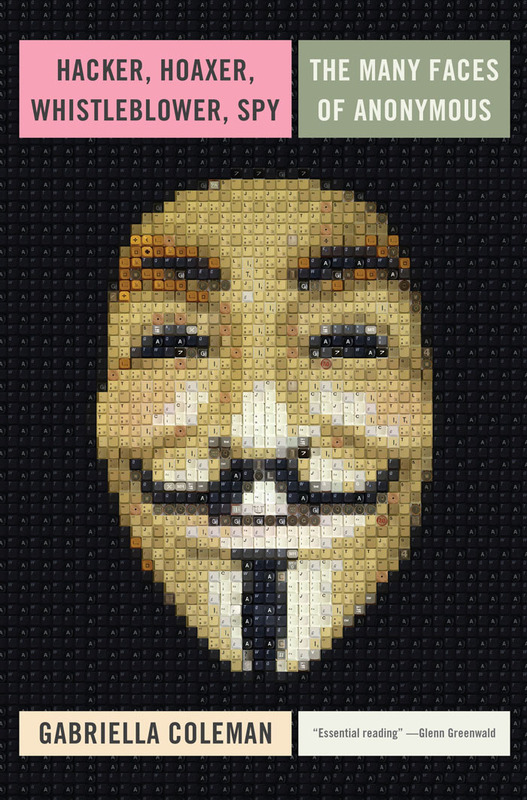 However, while containing a number of insights of interest to the general reader, the book ultimately falters as an assessment of Anonymous’s political orientation, or the state of hacker politics in general. Coleman begins with a discussion of online trolling, a common antagonistic online cultural practice; many Anons cut their troll teeth at the notorious 4chan message board. Trolling aims to create “lulz,” a kind of digital schadenfreude produced by pranks, insults and misrepresentations. According to Coleman, the lulz are “a form of cultural differentiation and a tool or weapon used to attack, humiliate, and defame” rooted in the use of “inside jokes” of those steeped in the codes of Internet culture (32). Coleman argues that the lulz has a deeper significance: they “puncture the consensus around our politics and ethics, our social lives and our aesthetic sensibilities.” But trolling can be better understood through an offline frame of reference: hazing. Trolling is a means by which geeks have historically policed the boundaries of the subcultural corners of the Internet. If you can survive the epithets and obscene pictures, you might be able to hang. That trolling often takes the form of misogynist, racist and homophobic language is unsurprising: early Net culture was predominantly white and male, a demographic fact which overdetermines the shape of resentment towards “newbies” (or in 4chan’s unapologetically offensive argot, “newfags”). The lulz is joy that builds community, but almost always at someone else’s expense. Coleman, drawing upon her background as an anthropologist, conceptualizes the troll as an instantiation of the trickster archetype which recurs throughout mythology and folklore. Tricksters, she argues, like trolls and Anonymous, are liminal figures who defy norms and revel in causing chaos. This kind of application of theory is a common technique in cultural studies, where seemingly apolitical or even anti-social transgressions, like punk rock or skateboarding, can be politicized with a dash of Bakhtin or de Certeau. Here it creates difficulties. There is one major difference between the spider spirit Anansi and Coleman’s main informant on trolling, the white supremacist hacker weev: Anansi is fictional, while weev is a real person who writes op-eds for neo-Nazi websites. The trickster archetype, a concept crafted for comparative structural analysis of mythology, does little to explain the actually existing social practice of trolling. Instead it renders it more complicated, ambiguous, and uncertain. These difficulties are compounded as the analysis moves to Anonymous. Anonymous doesn’t merely enact a submerged politics via style or symbols. It engages in explicitly political projects, complete with manifestos, though Coleman continues to return to transgression as one of its salient features. The trolls of 4chan, from which Anonymous emerged, developed a culture of compulsory anonymity. In part, this was technological: unlike other message boards and social media, posting on 4chan requires no lasting profile, no consistent presence. But there was also a cultural element to this. Identifying oneself is strongly discouraged in the community. Fittingly, its major trolling weapon is doxing: revealing personal information to facilitate further harassment offline (prank calls, death threats, embarrassment in front of employers). As Whitney Phillips argues, online trolling often acts as a kind of media critique: by enforcing anonymity and rejecting fame or notoriety, Anons oppose the now-dominant dynamics of social media and personal branding which have colonized much of the web, and threaten their cherished subcultural practices, which are more adequately enshrined in formats such as image boards and IRC. In this way, Anonymous deploys technological means to thwart the dominant social practices of technology, a kind of wired Luddism. Such practices proliferate in the communities of the computer underground, which is steeped in an omnipresent prelapsarian nostalgia since at least the “eternal September” of the early 1990s. HHWS’s overarching narrative is the emergence of Anonymous out of the cesspits of 4chan and into political consciousness: trolling for justice instead of lulz. The compulsory anonymity of 4chan, in part, determined Anonymous’s organizational form: Anonymous lacks formal membership, instead formed from entirely ad hoc affiliations. The brand itself can be selectively deployed or disavowed, leading to much argumentation and confusion. Coleman provides an insider perspective on how actions are launched: there is debate, occasionally a rough consensus, and then activity, though several times individuals opt to begin an action, dragging along a number of other participants of varying degrees of reluctance. Tactics are formalized in an experimental, impromptu way. In this, I recognized the way actions formed in the Occupy encampments. Anonymous, as Coleman shows, was an early Occupy Wall Street booster, and her analysis highlights the connection between the Occupy form and the networked forms of sociality exemplified by Anonymous. After reading Coleman’s account, I am much more convinced of Anonymous’s importance to the movement. Likewise, many criticisms of Occupy could also be levelled at Anonymous; Coleman cites Jo Freeman’s “The Tyranny of Structurelessness” as one candidate. If Anonymous can be said to have a coherent political vision, it is one rooted in civil liberties, particularly freedom of speech and opposition censorship efforts. Indeed, Coleman earns the trust of several hackers by her affiliation with the Electronic Frontier Foundation, nominally the digital equivalent to the ACLU (though some object to this parallel, due in part to EFF’s strong ties to industry). Geek politics, from Anonymous to Wikileaks to the Pirate Bay, are a weaponized form of the mantra “information wants to be free.” Anonymous’s causes seem fit these concerns perfectly: Scientology’s litigious means of protecting its secrets provoked its wrath, as did the voluntary withdrawal of services to Wikileaks by PayPal and Mastercard, and the Bay Area Rapid Transit police’s blacking out of cell phone signals to scuttle a protest. I’ve referred to Anonymous as geeks rather than hackers deliberately. Hackers — skilled individuals who can break into protected systems — participate in Anonymous, but many of the Anons pulled from 4chan are merely pranksters with above-average knowledge of the Internet and computing. This gets the organization in quite a bit of trouble when it engages in the political tactic of most interest to Coleman, the distributed denial of service (DDoS) attack. A DDoS floods a website with requests, overwhelming its servers. This technique has captured the imaginations of a number of scholars, including Coleman, with its resemblance to offline direct action like pickets and occupations. However, the AnonOps organizers falsely claimed that their DDoS app, the Low-Orbit Ion Cannon, ensured user anonymity, leading to a number of Anons facing serious criminal charges. Coleman curiously places the blame for this startling breach of operational security on journalists writing about AnonOps, rather on the organizers themselves. Furthermore, many DDoS attacks, including those launched by Anonymous, have relied on botnets, which draw power from hundreds of hijacked computers, bears little resemblance to any kind of democratic initiative. Of course, this isn’t to say that the harsh punishments meted out to Anons under the auspices of the Computer Fraud and Abuse Act are warranted, but that political tactics must be subjected to scrutiny. Coleman argues that Anonymous outgrew its narrow civil libertarian agenda with its involvement in the Arab Spring: “No longer was the group bound to Internet-y issues like censorship and file-sharing” (148). However, by her own account, it is opposition to censorship which truly animates the group. The #OpTunisia manifesto (Anonymous names its actions with the prefix “Op,” for operations, along with the ubiquitous Twitter-based hashtag) states plainly, “Any organization involved in censorship will be targeted” (ibid). Anons were especially animated by the complete shut-off of the Internet in Tunisia and Egypt, actions which shattered the notion of the Internet as a space controlled by geeks, not governments. Anonymous operations launched against corporations did not oppose capitalist exploitation but fought corporate restrictions on online conduct. These are laudable goals, but also limited ones, and are often compatible with Silicon Valley companies, as illustrated by the Google-friendly anti-SOPA/PIPA protests. Coleman is eager to distance Anonymous from the libertarian philosophies rife in geek and hacker circles, but its politics are rarely incompatible with such a perspective. The most recent Guy Fawkes Day protest I witnessed in Washington, D.C., full of mask-wearing Anons, displayed a number of slogans emerging from the Ron Paul camp, “End the Fed” prominent among them. There is no accounting for this in HHWS. It is clear that political differences among Anons exists, and that any analysis must be nuanced. But Coleman’s description of this nuance ultimately doesn’t delineate the political positions within the group and how they coalesce, opting to elide these differences in favor of a more protean focus on “transgression.” In this way, she is able to provide a conceptual coherence for Anonymous, albeit at the expense of a detailed examination of the actual politics of its members. In the final analysis, “Anonymous became a generalized symbol for dissent, a medium to channel deep disenchantment… basically, with anything” (399). As political concerns overtake the lulz, Anonymous wavers as smaller militant hacker crews LulzSec and AntiSec take the fore, doxing white hat security executives, leaking documents, and defacing websites. This frustrates Coleman: “Anonymous had been exciting to me for a specific reason: it was the largest and most populist disruptive grassroots movement the Internet had, up to that time, fomented. But it felt, suddenly like AnonOps/Anonymous was slipping into a more familiar state of hacker-vanguardism” (302). Yet it is at this moment that Coleman offers a revealing account of hacker ideology: its alignment with the philosophy of Friedrich Nietzsche. From 4chan’s trolls scoffing at morality and decency, to hackers disregarding technical and legal restraints to accessing information, to the collective’s general rejection any standard form of accountability, Anonymous truly seems to posit itself as beyond good and evil. Coleman herself confesses to being “overtly romantic” as she supplies alibis for the group’s moral and strategic failures (it is, after all, incredibly difficult for an ethnographer to criticize her informants). But Nietzsche was a profoundly undemocratic thinker, whose avowed elitism should cast more of a disturbing shadow over the progressive potentials behind hacker groups than it does for Coleman, who embraces the ability of hackers to “cast off — at least momentarily — the shackles of normativity and attain greatness” (275). Coleman’s previous work on free software programmers convincingly makes the case for a Nietzschean current running through hacker culture; I am considerably more skeptical than she is about the liberal democratic viewpoint this engenders. Ultimately, Coleman concludes that Anonymous cannot work as a substitute for existing organizations, but that its tactics should be taken up by other political formations: “The urgent question is how to promote cross-pollination” between Anonymous and more formalized structures (374). This may be warranted, but there needs to be a fuller accounting of the drawbacks to Anonymous. Because anyone can fly its flag, and because its actions are guided by talented and charismatic individuals working in secret, Anonymous is ripe for infiltration. Historically, hackers have proven to be easy for law enforcement and corporations to co-opt, not the least because of the ferocious rivalries amongst hackers themselves. Tactics are also ambiguous. A DDoS can be used by anti-corporate activists, or by corporations against their rivals and enemies. Document dumps can ruin a diplomatic initiative, or a woman’s social life. Public square occupations can be used to advocate for democracy, or as a platform for anti-democratic coups. Currently, a lot of the same geek energy behind Anonymous has been devoted to the misogynist vendetta GamerGate (in a Reddit AMA, Coleman adopted a diplomatic tone, referring to GamerGate as “a damn Gordian knot”). Without a steady sense of Anonymous’s actual political commitments, outside of free speech, it is difficult to do much more than marvel at the novelty of their media presence (which wears thinner with each overwrought communique). With Hoaxer, Hacker, Whistleblower, Spy, Coleman has offered a readable account of recent hacker history, but I remain unconvinced of Anonymous’s political potential. Gavin Mueller (@gavinsaywhat) is a PhD candidate in cultural studies at George Mason University, and an editor at Jacobin and Viewpoint Magazine.